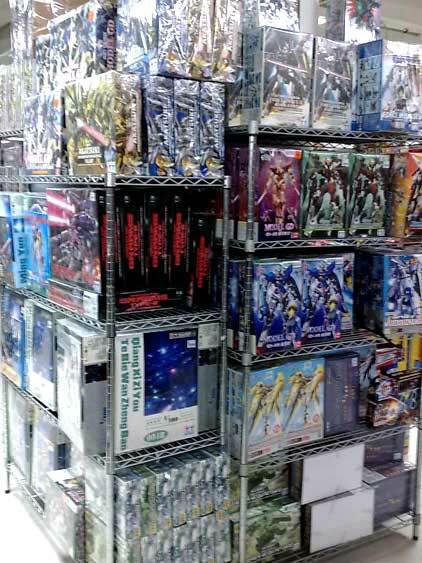 Was surprised to see this in a Mall, a whole rack of counterfeit (Bootleg) Gundams. I found this when I went scrounging for some modelling paint for the 1/72 VF-25G I was planning to assemble. Turned out that my budget wasn't as shot out as I had thought it would be as the cost of repairs in our car wasn't as big. Still compromises had to be made as I wasn't able to buy a compressor anymore for the airbrush I had bought. Eh, back to the post! I wonder if the purchasing people at the store are aware that what they are selling is fake? Sometimes you can't blame them because they really don't know what it is that they are buying. Having experience with sales people before, some bad guys will tell you that what they are selling you will fly off the shelves pretty quickly, so on your part you will be encouraged to get some stock of their product without knowing that you are violating copyright's. 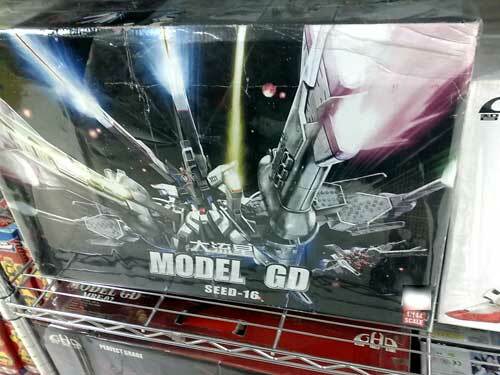 In order to solve this problem and put an end to it, Bandai has to go after the people making these fake products in China. 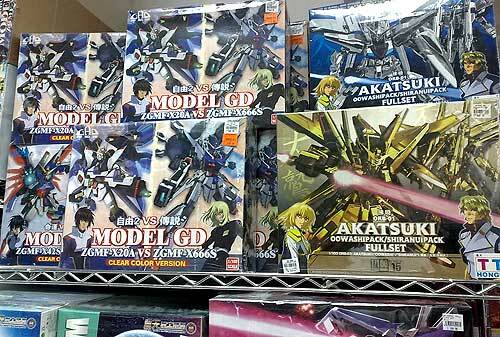 This Meteor Unit + Freedom Gundam copy was selling for 2941 yen, while on the other side of the store where they were selling the real stuff, its price was about 11764 yen. You could say that the bootleg version is about 75% cheaper than the original ones. 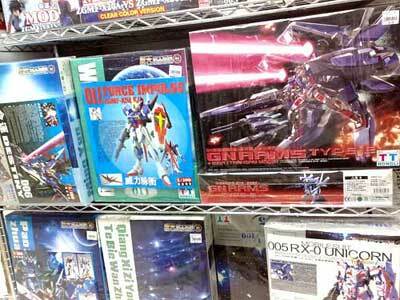 At Hobby Link Japan, this was selling for 8000 yen. 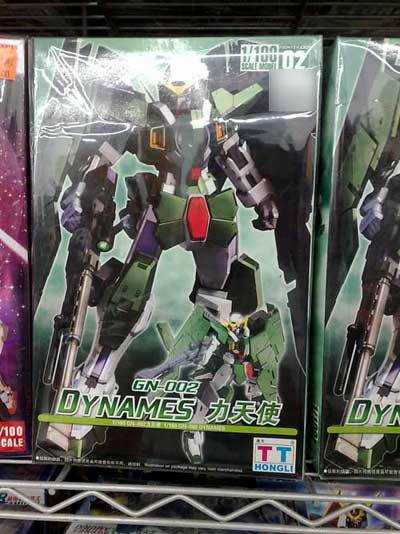 This bootleg 1/100 Gundam Dynames was selling for about 1176 yen, quite cheap compared to its genuine 1/100 counterpart which was selling for 2300 yen at HLJ. As a barometer, the MG kit I bought online cost me about 5200 yen total with the shipping. It seems to be packaged as a "Hong Li" brand. 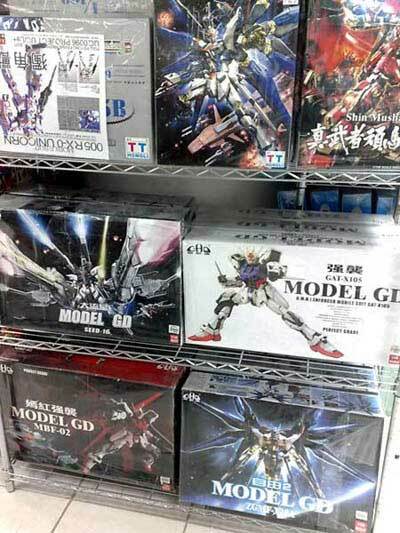 Even without the distinct "Gundam" name attached to the models, its quite obvious that they are taken from the original because of the box covers. I'll probably buy one in the next few days because I'm really intrigued as to the quality of this product. User feedback I've read about this is that the workmanship is really shoddy and that the parts are ill fitting. One other good use for a crappy and shoddy counterfeit Gundam is for practicing ones skill in painting, weathering and panel lining, hehehe. I'll post a review once I've bought one already.